A 19-year-old university student has described his photograph of a white fallow buck sneezing as a "one-in-a-million shot". Oban van Schie took the snap of the deer at Bradgate Park in Leicestershire while taking a ride in the countryside on his motorbike following a "stressful" day. He took along an old SLR camera and a few 20-year-old lenses given to him by his parents. He says he spotted what he believed to be an "elusive" white fallow buck after it moved away from a herd of other deer. Oban told the BBC: "I managed to get to a safe distance of about 10 metres without disrupting the herd and captured the photo of the fallow buck sneezing by pure chance. "I didn't realise what I had until hours later when I began editing my photos." 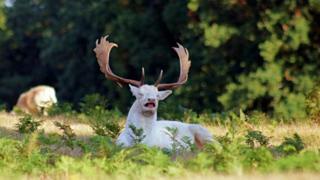 After posting the image on Reddit, the white fallow buck's sneeze has been upvoted - a sign of popularity - almost 90,000 times on the Mildly Interesting and Photoshop Battles subsections of the site. On Reddit people have been referencing a joke in Netflix cartoon series BoJack Horseman whereby the title character - a celebrity talking horse - is dismayed the news continues to use a stock picture of him sneezing at a party. As Isperfectlycromulent quoted: "Why do they always use the sneezing picture?" Several other posters pointed out Oban should have watermarked the image, as it was "something that literally no other photographer has captured". Although another Redditor was happy that "finally, my Venn diagram of 'albino stag pictures' and 'sneezing stag pictures' can intersect".